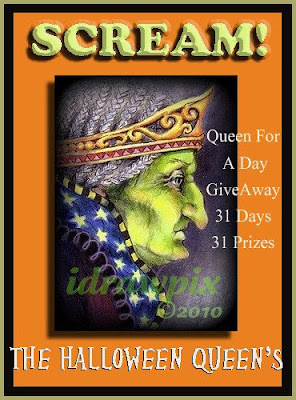 ARTISTIC HALLOWEEN QUEENS: A Queen for a Day Giveaway! A Queen for a Day Giveaway! 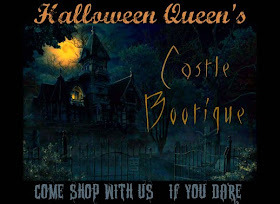 The Halloween Queens have gotten together to have a QUEEN size giveaway! 31 PRIZES IN 31 DAYS! And what better time than for Halloween!! Enter now through October 15 for a chance to win one of these fabulous prizes below, just click on the banner for a larger view. Drawing will start October 1st and go through the entire month with a grand prize on October 31st! The grand prize will be revealed October 1st! All you have to do is leave a comment in this post telling us about one of your favorite Halloween traditions. Please don’t forget to leave your email addy so you can be reached if chosen!! Also leave a comment if you post this giveaway on your blog or facebook linking it to this post for more chances to win. Remember you must leave a separate comment for each entry you complete. Participants may win more than one prize!! So start SCREAMing the news now!! We are very sorry but we can only except US and Canada entries only. One of my favorite Halloween traditions has to be my annual party. I have three acres with the back half of it woods, so I have tons of decor, fire pits, live bands and other entertainment. People can set up a tent if they plan to drink, and the neighbors either come over, or are nice enough to ignore the cars and noise for one night. Thanks for the chance for prizes. I am always trying to add other artists' work to my collection. My favorite part of Halloween are the kids dressing up and trick or treating. We trick or treat first and then come back to the house and hand out candy. I'm drooling! Such fabulous art pieces! I'd be thrilled to win any one of them! Please throw my name into the hat! I blogged about the giveaway too! I screamed news of this giveaway from my Facebook rooftop as well! You can count me in! I would love to throw my name into the ring of the drawing! I love the pieces! Owwwwww...what a wonderful event. One that gives and gets...gives to those that come to visit and gives all of your wonderful artist the chance for others to see their work. One of our favorite Halloween traditions is the carving of the pumpkin. We as a family sit and decide just what we want our pumpkin to look like. Then we all dig in (literally) and get to work...together!!! I have posted about your amazing event on my blog. I'm so excited about this 31 for 31 and wanted my friends to know all about you too. Posted on my FB page as well. Happy Hauntings!!!!! One of our family's Halloween traditions is decorating the yard. We have hay bales and witches and scarecrows and pumpkins. The neighborhood kids love to see what we do every year. It all very fun and whimsical cause I don't want to scare the little ones who come to the door. What a great give away! When i was a little girl and living in Ohio in the 50's we used to say "it's beggars night" rather than trick or treat. My mother was from kansas, so I don't know if this was a kansas or an Ohio tradition. Halloween is the best - makes me feel like a kid again! My mom and I do the Chadds Ford Great Pumpkin Carve every year, that is one of my favorite traditions. We also have a huge Halloween party. Wow! This is fabulous! I love the CANDY!!! I always go get stuff that I like and then 'forget' to put it in the bowl for the kids! That's a favorite tradition of mine! LOL! i also posted about the giveaway! One of my favorite Halloween Traditions? Every year my friends and I hold a Tarot reading by candlelight... outside... in the woods. It's creepy... and fun, and we take along Hot Caramel Apple Cider! It's always been about Trick or Treating!! The first October after we arrived from England I had no idea why all my friends were walking up our driveway wearing "stuff".... but they told me all about it and happily I joined the group. Every year we brought to our homes bags of treats and $$$$. Our "costumes" were handmade... rags, dirt made by burnt corks and so on. But we had a ball. Now my grandchildren are following suit, tho' lucky for them, their Mother whips up "creations" for them to wear! Wow this is a great giveaway! !One of my fav Halloween traditions has to be decorating and getting the house ready with the kids.Now they ask me..When Mom are we going to decorate? My favorite time of the year, Halloween! We always made homemade costumes growing up because we did not have stores that made them back in the days. That made us use our imaginations. I think that is what made it so much fun! My favorite Halloween tradition is gathering leaves up and stuffing them in the plastic pumpkins and ghost to fill them up. Then I hang the ghost in my trees. I would love to be entered in your giveaway. I blogged about the giveaway...this is going to be so much fun!! oooh, What a great giveaway! I just read about it over at sweet Lisa's blog. Halloween happens to be my son's birthday, so a spooky birthday party is always something we do! I posting about this in my sidebar! Thanks for the many great chances to win something spooky special! I included a picture link on my blog sidebar! Just posted it up on facebook too! When my kids were little, the adults would take a beer or a cup with them and many of the houses would offer a "treat" to the adults too. Some warm mulled wine, cider, or even just a beer. It really made Trick or Treating in cold Michigan weather fun! I love bobbing for apples..but that just might be because I had a huge mouth as a kid and was the only game I completely dominate, lol. I grew up in Italy where there is no Halloween! :-( I know I missed out on decades of fun! We have the day of the Dead but it's not as fun as the Mexican one either. We simply go to the cemetery and bring flowers to our dear departed ones. It would be great to win a Halloween thingie...... thanks for the thrill of a giveaway! One of our Halloween traditions is the redressing of the mannequin who lives atop the refrigerator. I'm thinking of doing a black cat number on her this year. Oh, how I do love Halloween!! So many traditions to choose from. I'll start with this one: I always decorate the house on October 1st (this includes nearly every room in my house in one way or another and my front door/porch area). Some of my decorations are from my own childhood (a painted, illuminated haunted house my mother made when I was very young...about 30 years ago). I'm so excited to blog about the contest as well. I'll be back tomorrow to enter again! Ooooooo *dancing through the room* that is one I was waiting desperately for to celebrate my love of all seasons:):) Please count me in!!!! In my country, Halloween is best seen as a passing fashion, or as an "American silly habit we don't need". But I definitely do not share these ideas - as a goth, as a taphophile, as a deeply Autumnal person, as a Halloween addict. It is hard for me to pick just one favourite tradition - maybe it shall be the lighting of candles and digging apples into the Earth for the dead to have guiding lights and food on their way of passing into the Other World. I do this every year. Just blogged your giveaway and posted on FaceBook! Good luck! I love Halloween and every yesr for 7 years we though a big Bash! My fav tradition would be the Chilli in the crockpot and bundling my kids up to go out and SPOOK! I have posted to my FB Page and spooked out my Blog. How fun! Thank you for offering this awesome giveaway! What super-duper fun!!! I am also putting a link on my regular Cat In The Moon blog, and my year around Cat In The Pumpkin Moon blog! Thanks for the extra chances to win! Yo soy de España y aqui no hay mucha tradicion, pero eso no importa a mi me encanta Halloween y lo disfruto muchisimo. Adorno mi casa y como hago miniaturas ahora estoy acabando una escena de bruja para Hallowwen. Espero tener suerte y poder mostrar en mi blog, lo maravilloso que es Haloween a todos mis seguidores. Subo el aviso de sorteo a mi blog. Si teneis inconveniente en que se participe desde España, me lo decis para que no suba el aviso y no se hagan ilusiones. hmmm... didn't see my first comment that i left, so just in case it was accidentally deleted..
my favorite halloween tradition is definitely carving pumpkins!! My favorite Halloween tradition is decorating my house. I have already finished decorating inside this year (every room! ), but will wait to do the outside, as our little neighborhood ghouls like to help themselves to my outside goodies. Thanks for the chance to win some great prizes! I just posted your link on my sidebar. my favorite tradition is curving the pumkins!!! My favorite Halloween tradition has to be candy corn!! No matter how old I am it still remains my favorite! Screaming live to facebook now!!! Our favorite Halloween tradition has been taking our daughter trick or treating. Unfortunately, the tradition has ended as she is now in college, but I enjoyed it each and every time as seen through the wonder in her eyes. English costumes are increasing in Spain, but here is traditional to make a dessert called panellets...delicious!!!! Our Halloween tradition is to watch "Lady in White" I just love that movie. My favorite Halloween tradition has to be decorating the house. I collect everything Halloween and creepy and love growing my collection every year. I love fall festivals, corn mazes, pumpkin patches, haunted houses, scary movies, and games...but I'd like to start a new tradition of an annual Halloween party. Maybe this year! My Halloween tradition is my Halloween party I have every year. We all get together, watch scary movies and eat a lot of good food! I love Halloween, however in my culture, Dia De Los Muertos is how we celebrate the Halloween season. This year, we will be hosting a huge Dia De Los Muertos Fiesta, featuring a community altar! I can't wait! Our favorite tradition was going to the Cider Mill in Endicott NY. At the Cider Mill you could watch the donuts being made fresh. As you walked through there were barrels of candy apples, sweetbreads and gallons of cider for sale. When you were finished you could go to the Playhouse at the back of the building with your cider and donuts and watch a play. When I was little, my favorite tradition was trick-or-treating of course. Now that I am all grown up (or at least I APPEAR all grown up! ), I still love trick-or-treating, except now I am on the other side of the door. I love seeing all of the adorable little costumes and the smiling faces so full of excitement. The handmade costumes get extra candy! My favorite Halloween tradition is carving pumpkins. I LOVE the scent of mingled pumpkin and burning candles. it just wouldn't be halloween if we couldn't carve the pumpkins!!! thanks for the super spooky giveaway!!! My favorite Halloween tradition is holding a scavanger hunt and participating in our block party. Thanks to all for the chance to win some fabulous art. You "Halloween Queens" always give me so much to look forward to with your wonderful art. This Give Away is EPIC!! I love all the wonderful art! Halloween is a folk art lover's dream~ My favorite tradition is all the decorating and having an open house for adults and children alike with chili and chicken wings! One of my favorite traditions (out of sooo many we observe) is our annual Dumb Supper. Table is set in the finest gothic fashion with the ancestor chair draped in black gossamer, home cooked meal of several seasonal courses (like colcannon, corn chowder, pork tenderloin, pumpkin tarts - just to name a few). All family members write messages to whomever they wish and leave it under "their" plate. At the end of the meal, we burn all papers in a fireproof dish and take them outside for the wind to 'deliver' the ashes to our loved ones. I could write a novel with details about the whole event, but that's it in a pumpkin shell ;) Good luck everyone! 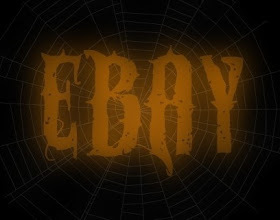 My email is raven(underscore)fae97 (at)yahoo(dot)com Happy Hauntings! Aaaannnd, I just posted about it :) Can't wait!! This is soo exciting! My favorite tradition for halloween is going to my sister's house and having a huge party then taking the kids trick or treating. I shared this on my facebook, under Martha Galvez. Wow! Did I say Wow...my favorite Halloween tradition is our annual Halloween Bash. We totally deck out the house very creepy...but with total style :D and everyone dresses up in costumes. It's just all around a great time. Thanks each of you for such a wonderful giveaway. I will also add the picture to my side bar. Wow would love to win any one of these fantastic prizes. Hmmm favorite Halloween tradition... I would have to say dressing up and handing out Halloween candy, then after watching a Halloween movie. One of my very favorites has always been HOCUS POCUS. Ok I have just blogged too! Whoo hoo! What a fun giveaway! Good Luck everyone! Having lived in Africa for many years where Halloween is only just becoming a commercial attraction, we held a Halloween party for our sewing group. Returning to live in the UK last year we joined in the fun. Made carved pumpkins with candles to put outside the front door, put up black cat and pumpkin cut outs in the front windows and of course had a supply of sweeties for the neighbour's children! Have posted a picture of the giveaway on my blog. My favorite Halloween tradition is seeing my Mom dress up as a very convincing witch (green face paint and all), to scare the kiddies when they come for their candy! Bahhahhah! My favorite Halloween tradition is getting ready for Halloween; picking out costumes and decorating both indoors and out! Our tradition is very simple. We take our two boys out to just a few houses, then RUSH back to our house. The boys enjoy receiving trick or treaters more than doing it themselves! I'll pass the word on this great giveaway! Each year before Halloween I put up the Halloween tree and decorate it with handmade creepy dolls from crafty friends. We also love to hand out candy and race with my Aunt to see who gets the most trick or treaters! What a great idea! Count me in please. My favorite Halloween event to do every year is to have a hay ride. We hook a trailer to the tractor, load it with hay, and take everyone for a ride in the trails. It's great fun! Then we come back for treats and games. Heading over to my blog now to post a link! Hi! I am so excited about this giveaway! Such beautiful art pieces! My favorite halloween halloween tradition is the school fall festival that my girls' school puts on! Everyone dressing up and getting together for a night of fun! Bobbing for apples etc!!!!!! Posting a link on my blog now and a mention for a blog post today! My favorite Halloween tradition is giving out glow necklaces instead of candy. It makes our place quite popular, with repeat visitors! It is so fun to look out and see all the glow necklaces moving up and down the street in the dark. I get them at the dollar store really cheap. It also makes the kiddos more visible to drivers on the street. My favorite Halloween tradition is at our church since I was a little girl we have always got together the night before Halloween, dressed up and had hay rides and a fall festival. We still do this and have so much fun!! People even open their trunks and have trunk or treat. We have so much fun from bobbing for apples to hay rides to giving out candy!!! I love this event, I am so excited to participate. I've posted the link on my Facebook page. My favorite Halloween tradition is to dress up every year to answer the door for trick or treaters. Unfortunately I've scared a few little ones away. Please enter me! Our family tradition is to make a large batch of Monster Cookies for class parties and trick or treaters. Each one is about as big as a dessert plate! It takes one full day, 1 dozen eggs a jar of peanut butter and a bag of m&ms and a few other goodies, but the result is well worth it! My favorite Halloween tradition is curling up on the couch with my husband watching a classic horror flick with a cup of hot chocolate awaiting the arrival of trick or treaters! QUEEN SIZE is right. Will list on my blog also. Dang just completed my first giveaway and no where near this. I love Halloween. My favorite tradition is to add more bodies every year to my big ole yard collection. By the end of this month more new bodies :O) I love how the neighbors come and walk through the yard. will also post on my facebook. I LOVE LOVE LOVE pumpkins and Halloween is a great time to carve them up. Wow! What a fantastic giveaway. The artwork is awesome! My favorite Halloween tradition is to give out candy to all the little trick or treaters. I especially love the 2-5 year old ones. My boys and I also carve a jack o lantern for on our front porch. At seven pm we leave to go to a friends house who immigrated from Sardinia, Italy and have some good Italian food and some wine. Sure hope I am one of the lucky winning names. My email is beggworld@msn.com. WOW!!! is all I can say about this wonderful giveaway! !..We weren't brought up on any halloween traditions that I can think of..but I do remember as a kid doing the halloween parade through each class showing off our costumes..I remember just waiting for the teacher to say it was okay to get in our costumes..the day would drag forever till that time..
Dodieman here again: Just added this great giveaway to my FB page. I hope I hope I hope I win!!!! When the kids were young, it was coming up with a new costume that I would make. Now that they are grown, my husband and I spend the night watching horror movies. My favorite Halloween tradition is taking our grandkids to -The Pumpkin Patch...corn maze and spooky house, eat cookies and cider & hanging ornies on a mini tree. Costumes - definitely costumes! Every year growing up we started planning and preparing months in advance to creat the perfect costume - back them mom made the costumes...but when i got older - oh my....I went hog wild! Every year our goal was to go out to a planned bar with big prizes and collect out bounty! I must have banked over $3,000 in prize money over the years! I am 47 years old now, and although Ihave out grown the bar scene...I still MUST dress up - even if it is to simply answer the door to hand out candy! Doesn't everyone love to play dress up? Happy hauntings! I have to say my favorite Halloween tradition is getting all of the decor out of the boxes and turning my house into a fallish/Halloween haven. This will be my first Halloween with children, so I can't wait to make new holiday traditions with them! hello, just found your blog link on reto rudolphs blog.. hmm ..my new tradition in the past few years has been doing a Halloween tree and adding Halloween artist made ornaments every year..
One of our many Family Halloween Traditions is going to the Pumpkin Patch every year and enjoying the day.....Such Great FUN!!!!! We always come home with Huge pumpkins and Tiny Pumpkins and New Halloween Decor if something catches my eye in the Gift Shop!!! I just realized that in my first comment, I said nothing about Halloween traditions! It's my favorite holiday, so I do have many.....I guess my favorite would have to be every year when it's time for the kids to go trick or treating, I take a picture of them and my Dad departing at dusk with the street lamps glowing in the distance. With each year, my Dad stays the same, but the kids of course have gotten bigger. I love it as a way of marking the passage of time and commemorating each Halloween. My favorite Halloween tradition resides in my childhood. The town had a kid's parade every Halloween. Kids in costumes lined up and 1st, 2nd and 3rd place prizes were awarded for each grade. It was great. Got it on my blog too!! For me it's all about the decorating. I usually stuff old overalls and a flannel shirt with hay to make a scarecrow that sits on my porch. I light luminaries I made years ago with candles to light the path to the door, and a big Halloween wreath hangs by the door. Some years I get ambitious and carve pumpkins. I often have a bucket filled with water and apples for bobbing, but this is for the adults and never for children. The inside of the house is also decorated with Halloween themed decorations, both scary and not.A witch's hat graces the entry. It's one of my favorite times of the year. I'll be back when I've blogged about the giveaway. Thanks for allowing me to enter. I just love to decorate for Halloween, it's my favorite holiday of course. I love getting candy corn, caramel apple pops and more. I love when the temps start to dip adn the leaves start to change. It's just a magical time of the year. Our favorite tradition is carving pumpkins. Some are funny, scary or just plain goofy! We try and at least get 2 each and with 5 of us that is a ton of pumpkin guts.... LOL! Please enter me into the contest! ...making the costumes....still my favorite thing to do! Oh my, well decorating for the trick or treaters of course is our Halloween tradition. I would love to be entered in your exciting giveaway. I've added your giveaway link to my left sidebar. For our family it's the decorating, and carving pumpkins. Even though my kids are grown, we all still spend one whole day getting the yard done. As weird as this may sound, we have a firetruck(2actually)that we decorate as well. All the kids that come by love it, and parents want their pix with it. We all dress up and hand out candy. It really is great family time. we play witchy movies throught out the day like the worst witch and practical magic while we decorate the house getting ready for our annual party, they listern to the great halloween CDs we have made over the years with classic's like monster mash and werewolves in london to name a few, as the party kicks of we have a huge fire pit a dancing room with projectors and fog and loads of spooky inspired food. after witching hour in the early hour when the party is over. we watch a classic horror like bride of frankenstien and fall asleep on the sofas with a big mug of hot chocolate and brandy. every year our halloween gets better and better,we all love the night so much. OMG I just found your blog... I must follow! What awesomeness! Will be a frequent stalker and buyer! I Love Everything about Halloween...The anticipation leading up to the big night, the Candy, the Costumes, the Decorations!!! We will be having our 6th annual Halloween Party! I even put up a Halloween Tree! Forgot to leave my email! The local Halloween parade is my fave tradition in my small town. The children trick or treat from 5 - 7 and then the parade begins. Such fun for the children! My favorite part of Halloween is decorating for the day. This year starts the traditon of making something for my little grandaughter every halloween. This 1st year, I am cross-stitching her a trick or treat bag and then filling it with goodies of all kinds. Oh, I love everything Halloween! Decorating, creating a spook house, trick or treating with little ones or handing out candy. 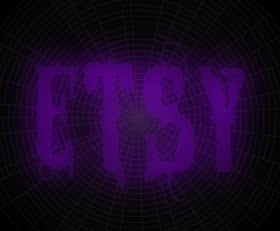 Creating all sorts of halloween cards and projects and sharing them. Halloween has changed for me as my children have grown, but now that I have grandchildren, the fun starts all over again! Lovely page w/ great colors! I have to every year make the jello dirt cake grave yard. My daughter is going to be 23 and my son is 17 and I still make it for them. Hello! Halloween has always been one of my favorite holidays! Our only tradition was to go trick or treating. One special memory was when I was 7 and my grandmother dressed up and went with me. She had as much fun as a kid! She loved trying to get the neighbors to guess who she was and nobody could! They would always guess a kid and not a 61 year old grandma! Thanks for the opportunity to win one of your beautiful items!! Thank you so much for this giveaway for whomever wins! This is a very new Halloween tradition for me that started last year. On the Travel Channel they have this show "Ghost Adventures" that I love! The guys are cute and they go to some really wicked haunted places. Every Halloween they pick one of the most haunted places around (last year it was this old, deserted and scary sanatorium)where for all of the Halloween Day and Night they live film it so people can call in and say if they've seen any spirits or presences...I loved it last year and felt I was right there..So, that's my favorite new Halloween tradition. Thanks again for the giveaway! Got your banner posted on my blog with a link back here to help spread the word. thanks again for yet another spectacular event. One of my favorite Halloween traditions is making costumes for my grandchildren. It is always a challenge. They tell me what they want to be, usually in August or September and then I go to work lloking for material and creative ways to make the best costumes possible. I love the decorations! Halloween is so much fun to decorate because there are so many fun characters! Your banner and a link back to your blog is posted on my blog. I hope the lucky winners find their way to you through me. Another favorite Halloween memory is the CANDY! I still have a sweet tooth and eat as much as I give out to the trick or treaters! LOL. My favorite thing to do for halloween is to find a new and different way to carve the annual pumpkin. posted about your generous giveaway . Thanks so much for your giving spirit. One of my favorite Halloween traditions or things to do is being able to put up all sorts of "witchy" decorations and not having anyone take offense :) The Witch is In! What a great giveaway! I'd love to join the fun. One of my favorite traditions (besides eating way too much candy) is a more recent one. I work in an Emergency Department, and each year we'd have a staff pumpkin decorating contest. Patients and staff would vote on the best. The only rule - NOT cutting into the pumpkin, so it would last through the month. The creativity was amazing. We always have sabbat dinner the night before Halloween. That way the importance and focus of the season. The grands love it...sabbat dinner, Halloween and then Day of the Dead...a three fer. Oh, and I just posted to my blog about your event, including your badge and link to this post. I love sitting outside and watching all the kids walk around and give out halloween candy. We do usually go to an apple orchard though, so I suppose that's another good tradition. One of my favorite Halloween traditions is playing dark and stormy music from speakers hidden on our front porch. Of course the porch will be decorted as well, with flying bats and witches with glowing eyes and lots of pumpkins and spiders. I am off now to spread the word. Spreading the word on my blog. With some other parties and hops. I also posted this on my blog!! Great blog and AWESOME giveaway!!!!! I LOVE Halloween and probably have more traditions than most. Decorating-inside and out but before decorating another tradition is Halloween shopping. Always on the lookout for new ideas and decorations. The shopping is pre and post (have to get the markdowns for those things I didn't purchase pre!) I always participate in at least one (who am I kidding? ), several art swaps and collaborative books/decos. Create as many altered art projects as necessary. Go on a ghost walk. Host a Halloween party. A trip to the pumpkin patch and farmers market for hay bales, pumpkins, corn stalks, etc.Those are some of my favorite traditions. Will post on my blog too! My favorite part of halloween is the costume! When else can I show up at work in fairy wings? I also love anything pumpkin (pumkin latte, pumpkin muffins, etc), candy, and caramel apples. I have my own traditions of setting up a dia de los muertos altar, and leaving food out for both the dead and the fairies. My fav tradition was the "dead" dinner. We would cook all day, and set the table for thoes that passed and of course us also, and we sat and ate with them, talked to them, told them all the news! It was a wonderful tradition! My favorite tradition is having a big dinner and setting a place for the people in our lives that have passed on. My favorite tradition is splitting the quirky with the ceremonial -- Lighting all of my lanterns and setting a spooky scene for the trick-or-treaters, then retreating to the backyard in the later hours for a bonfire and observation of Samhain. My favorite Halloween tradition is decorating up the entire house and yard and putting on our free annual Haunted house for our entire town. We get between 500-700 kids and adults through in about 3 hours on Halloween night. Everyone who comes through gets candy. We have been doing this for well over 10 years now and it just gets bigger and better every year. The kids love it and i now have kids that used to come through the haunt bringing their kids through it too. It is such a reward to see all the smiles and laughs and screams each Halloween! One of my favorite traditions is getting together with my extended family for trick or treating. My sister in law makes white bean/chicken chili and I bring cornbread and dessert. The kids get to go out and collect candy while grandma stays home and passes more out to the people who come to our door. Fun times! I'm a bookcrosser, but this tradition began before BookCrossing, with comics, originally. All through the year, whenever I go to thrift shops or garage sales, I purchase children's books that have Halloween, scary, magic, or other related topics. On Halloween, our large front porch is bordered in tables full of books for all ages, even board books for babies. Each child who comes to our house can choose as many books as they want, plus they get a goodie bag full of pencils, crayons, erasers, sharpeners, and anything else I find for fun, as well as candy. We provide books for children and adults. Sometimes, the kids will come, leave, and ten minutes later a few parents will come to the house with quickly made paper-plate masks, asking for books. We also provide "parent packs" which are a zip baggie filled with a packet of tissues, a couple band-aids, and a few chocolate mini treats for the parents. We provide cold bottled water from a cooler and hot coffee from a thermos. It's like having a party on the porch, but with a book theme. I usually give away 150-200 books a year, mostly to children, and every year they're more excited to see our porch. We chat books with anyone who likes them. We've only missed one year since 2000, and it was to attend our son's Halloween wedding. petiroja is at gmail dot com. I'm also 4libros on BookCrossing.com if anyone wants to look me up. Hmmm....favorite tradition....I do really like bobbing for apples and making mulled wine, but I'm going to have to give it to divining. I read runes, a lot of my friends do tarot, so with Samhain being a great night to do readings we all do a reading swap! The best part of Halloween, is everything!!! We plan next year's events on November 1st every year. Since we live in the middle of nowhere, we drive the children to a near by subdivision for trick or treating. It's a great place, some of the homes have treats for the adults too (aka jell-o shots). Then we have a party for all the childrens' friends on the weekend. My son decorates the yard from the roof to the ground with all things macabre. We make all the costumes and all kinds of food. We also have a Halloween "advent" calendar. It's great for this is our New Year celebration. My favorite tradition is spending it with my grandkids. This means I have to drive to them, and sometimes I have to drive hours to get to them, but it is fun when I get there. Great giveaway! I love to help make props with my hubby and we have also spent some time working on a Halloween trail scaring people! My favorite Halloween tradition is decorating the house and going out trick or treating with my kids. Nothing can beat the happiness and excitement in their faces! My birthday is October 3rd, so that's my official kick-off for the Halloween Season. That's when I get out all my seasonal kitchen-goodies: Halloween mugs, plates, tablecloths, etc. I can't very well celebrate my birthday without eating off of scary plates, now can I? I just re-read the rules and saw that I have to leave a separate comment for each place I posted about this contest. I was the first one to comment, so my original is way up there, lol. My favorite Halloween Tradition... I don't have any true traditions, I enjoy the seasons as soon as the leaves start to turn.